Anyhoo, on the east side of Mazomanie lies U.S. 14 and Highway 78… and a bar named Rookie’s, a State Trunk Tour favorite. Popular with baseball players (the owner of Rookie’s owns the Madison Mallards), bikers, drivers and craft beer aficianados, Rookies is what most other sports bars strive to be. Memorabilia is here in incredible abundance. 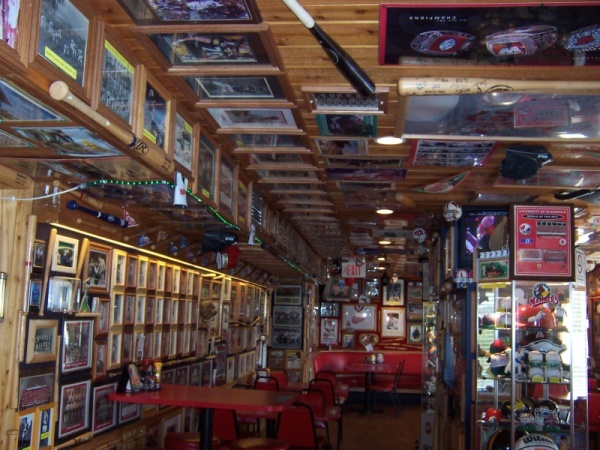 Few square inches of wall – or ceiling – at Rookie’s is uncovered by sports memorabilia. Seriously. 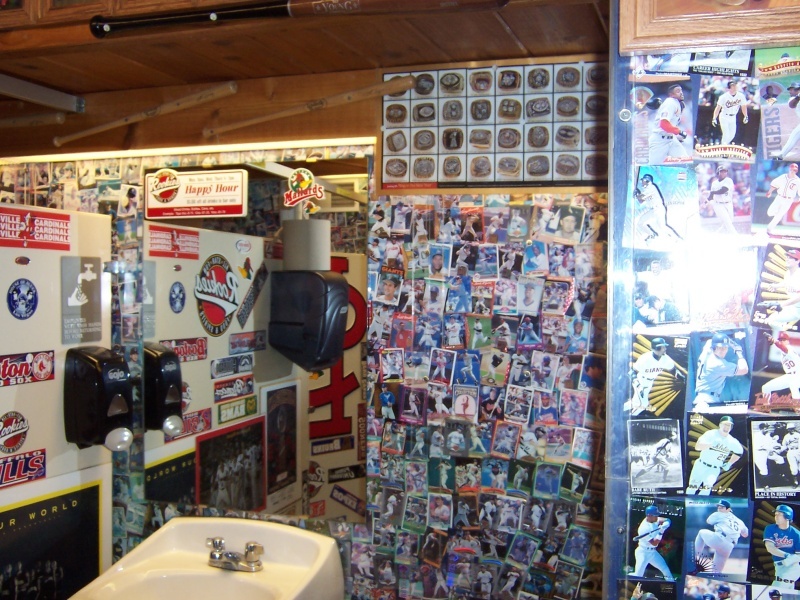 This is the bathroom at Rookie’s. 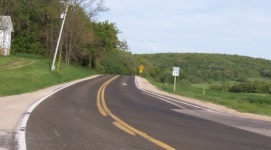 From the intersection with U.S. 14/Hwy 78, Highway 19 begins its path north and east across the fields and rolling hills of northern Dane County. Coupled with 78 for a brief spell, Highway 19 splits off and begins its trek east. 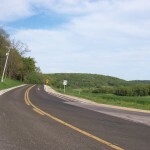 Through much of this stretch, the road hugs the hill next to a valley along Halfway Prairie Creek, which is as appropriate a name as any, given the topography. 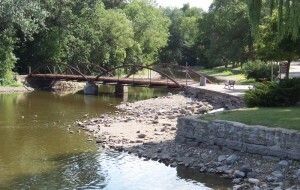 Indian Lake County Park is one of the largest parks in Dane County, which is one of the largest counties in the state. The scenery here is pretty enough, but if time allows hit the walking trails and check out the historic hilltop chapel, which was built in 1857. 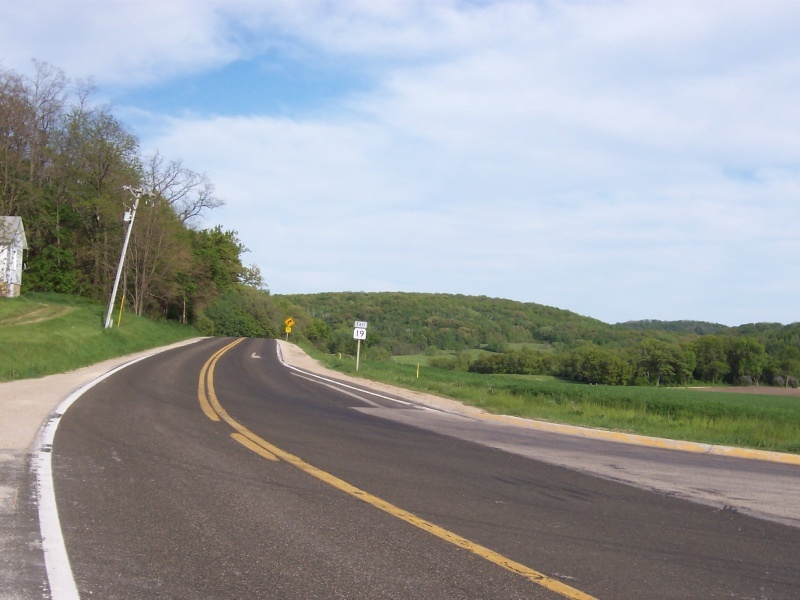 Highway 19 threads its way through northern Dane County, with hills often lining its north side. After about nine curvy miles, U.S. 12 shows up; Highway 19 joins it for about a mile and a half before heading east on its own again. Farms and a state marshland flank the road as you make your way into a uniquely-named town. The town of which we speak? 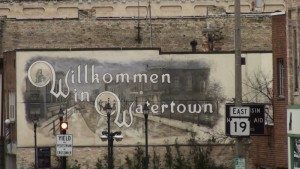 Waunakee (pop. 12,097). the “only Waunakee in the world”, as they like to point out. 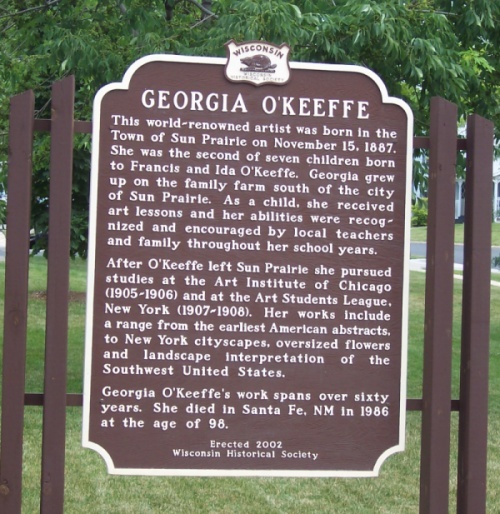 It was founded as Leicester in 1870; the following year, two early settlers persuaded the St. Paul Railroad – with some cash and land in hand – to relocate through their property instead of the original intended location two miles north. A post office and other buildings sprouted up, and the village incorporated as Waunakee (one Native American meaning: “the fair and pleasant valley”) in 1893. 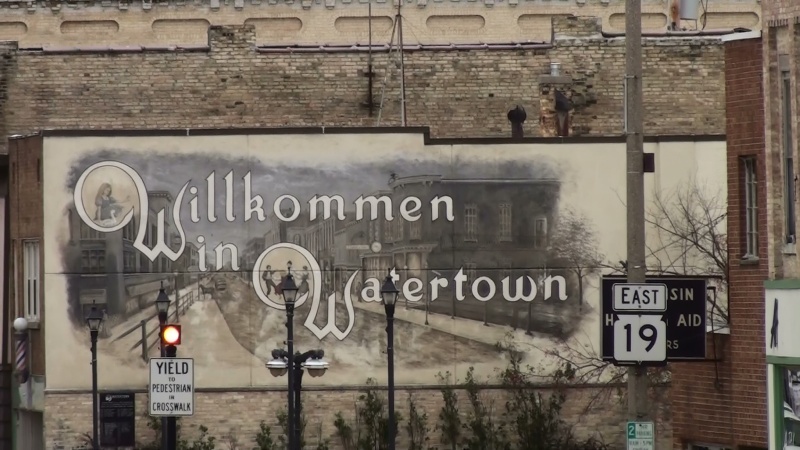 Waunakee is growing quickly, and its downtown is seeing redevelopment. 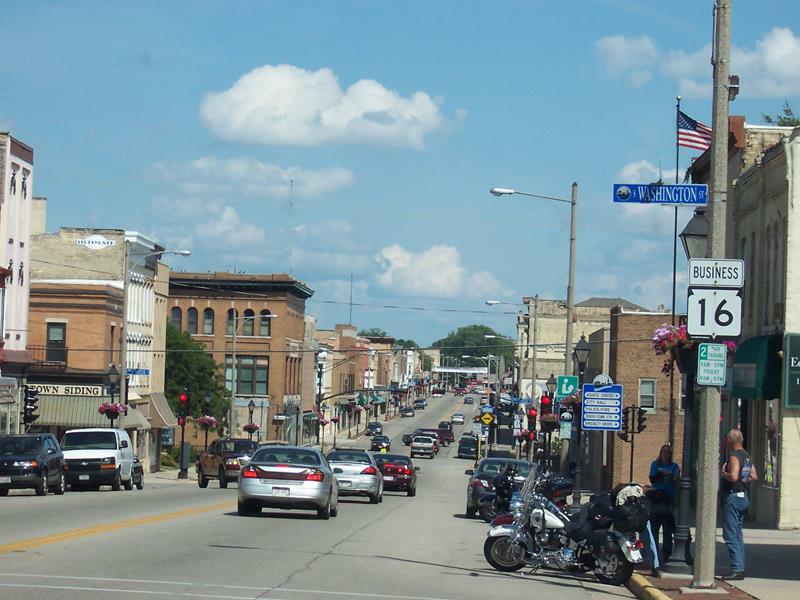 Highway 113 joins up in Waunakee on the town’s western side and rides with Highway 19 into the heart of downtown, which features a lot of older buildings and boutique shops along with a slew of newer developments, designed to bring in residents to downtown as well as more business. Where Highway 19/113 crosses the main railroad line downtown, you’ll see the old train depot; today, it holds the Visitor Center where you can get more info on the town. On the other side of the tracks from the old train depot, you’ll find Lone Girl Brewing Company (114 E. Main Street, 608-850-7175.) 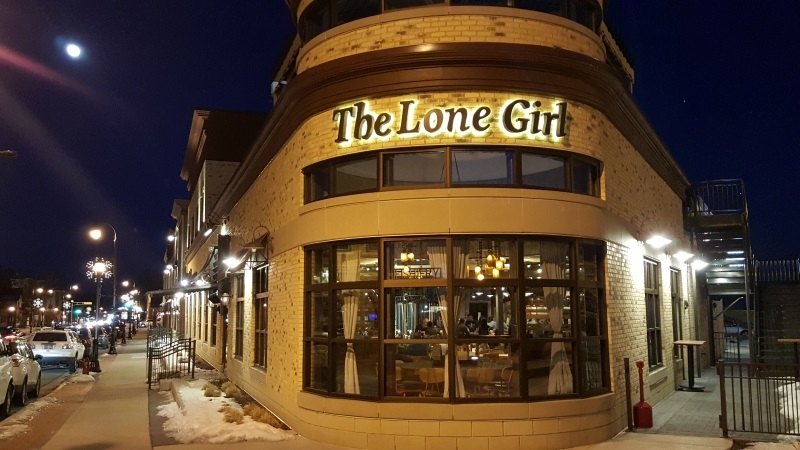 Located in a nicely renovated building, Lone Girl opened up in 2015 and offers a variety of brews made within, along with a restaurant offering an extensive menu. On warm days and evenings, the rooftop opens up for movie showings, live music, games, and more beer sampling. 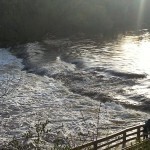 Weather-proof are brewery tours, which are offered at various times, usually on Sundays. 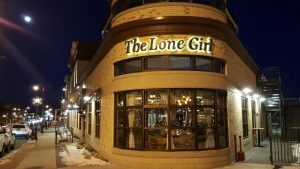 Lone Girl is open seven days a week, starting at 11am every day except Monday, when it opens at 5pm. It’s open all the way until 2am Thursday-Saturday, unless things are really slow. But with this brewery’s popularity, that’s not a common occurrence. Brew samples at the Octopi Brewery in Waunakee. Heading out of Waunakee, Highway 19 rides some higher grounds that, on a clear day, affords glimpses of the State Capitol dome and several of the high-rise buildings on the UW-Madison campus, all about 8-9 miles away on the other side of Lake Mendota. 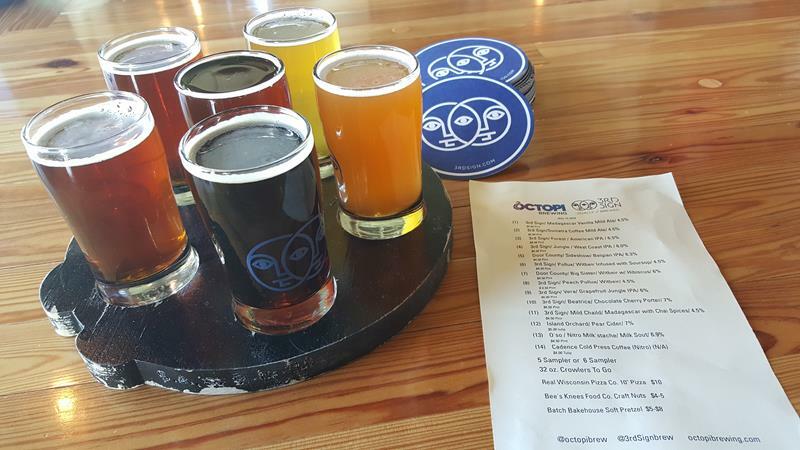 A brief jump south on Hogan Avenue lets you reach Octopi Brewery, a craft brewer helping numerous brewers across Wisconsin meet their capacity needs. Opened in 2016, their Tap Room offers a wide variety of samples and makes a good stop. Shortly thereafter, Highway 113 does break south to head towards the capital city. Highway 19 continues to head eastward, towards the Interstate and Windsor. About six miles later, Highway 19 reaches the increasingly busy crossroads around I-39/90/94, the longest triple-Interstate concurrency in the nation. 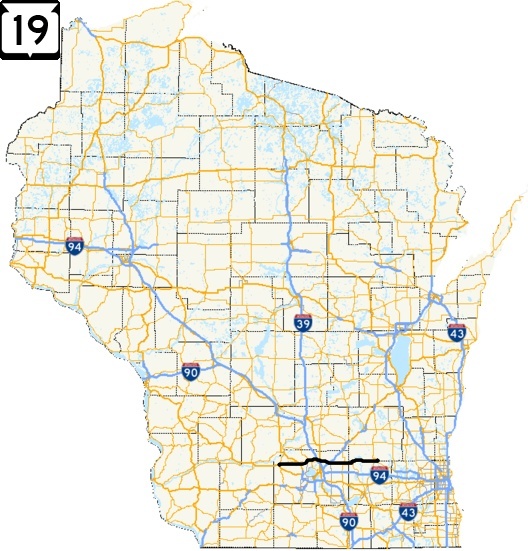 At this point, you could jump on I-39/90/94 for fast access to Madison, Chicago, and Milwaukee to the south or La Crosse, Eau Claire, and Minneapolis/St. Paul to the north; but a more Wisconsin-y way to go would be to access the local cheese shop right within sight via County CV, the Mousehouse Cheesehaus. Under the same family ownership since 1988 but with origins as a cheese shop dating to the 1960s, Mousehouse offers over 300 varieties of cheese from over 40 cheesemakers. You can browse it all once you pass under the massive mouse perched on the roof (his name is Igor) and wave back at the welcoming mice in the entryway; their names are Maxine and McKenzie. Along with cheese (packs, curds, spreads, and more), Mousehouse offers homemade fudge, freshly-made sandwiches, wine, beer, t-shirts, books, knick-knacks, and other items that remind travelers that they’re definitely in Wisconsin. We do enjoy their summer sausage and swiss sandwich; sample some goodies and stock up on your cheeses before you continue your Highway 19 Tour! Along with the Mousehouse and a slew of restaurants, gas stations, and a major Pepsi facility, Highway 19 meets U.S. 51, just east of the I. 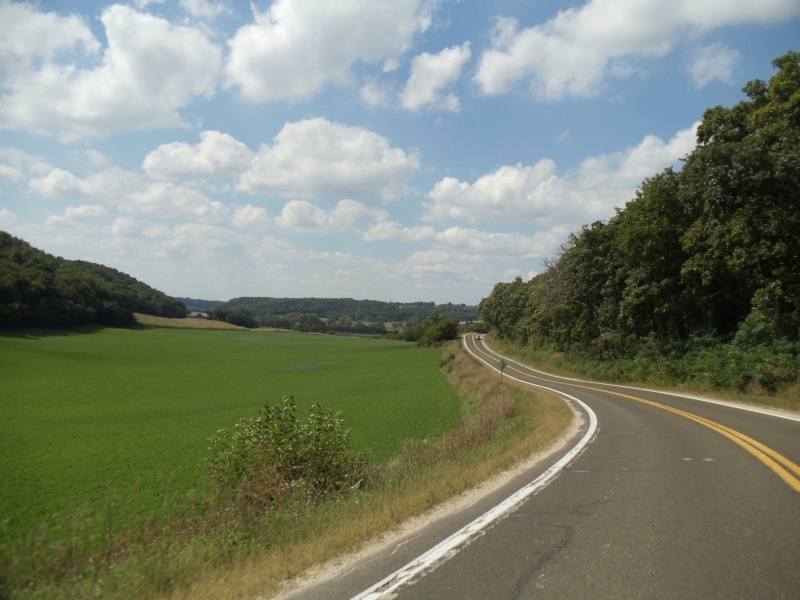 Highway 51, once the primary road north out of Madison, is nicknamed “Wisconsin’s Backbone” because it basically runs right up the center of the state; it’s a freeway briefly at this point too. A lot of people consider this the dividing line between the western and eastern half of the state. As we reach this “eastern half,” you pass Token Creek, currently an unincorporated crossroads that we think will be a booming suburb before too long. But another booming suburb, while being a significant community in its own right, is coming up. Past tiny Token Creek we reach U.S. Highway 151, which now an expressway from Madison all the way to Fond du Lac that bypasses the heart of Sun Prairie (pop. 30,871), one of the fastest-growing cities in Wisconsin. Highway 19 ducks under U.S. 151 and works its way downtown so you can experience the place. 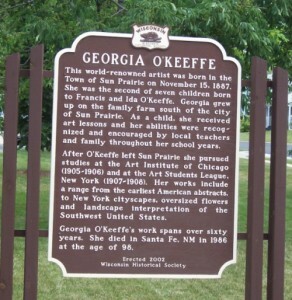 As Georgia O’Keeffe’s birthplace and childhood home, Sun Prairie proudly notes her history right along Highway 19. 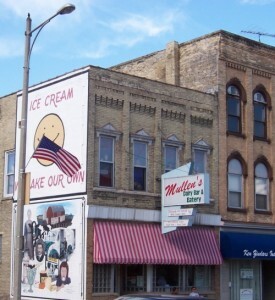 Sun Prairie’s downtown includes The Cannery, a former canning factory that now houses apartments, restaurants, and shops. Rising above is the unique Columbus Street Water Tower, which went up in 1912 and features a design combining stone, metal, and wood. The Market Street Diner (110 Market Street, 608-825-3377) has an old-school and Art Deco feel (even though it’s not from the era originally) and serves up great classic diner food. 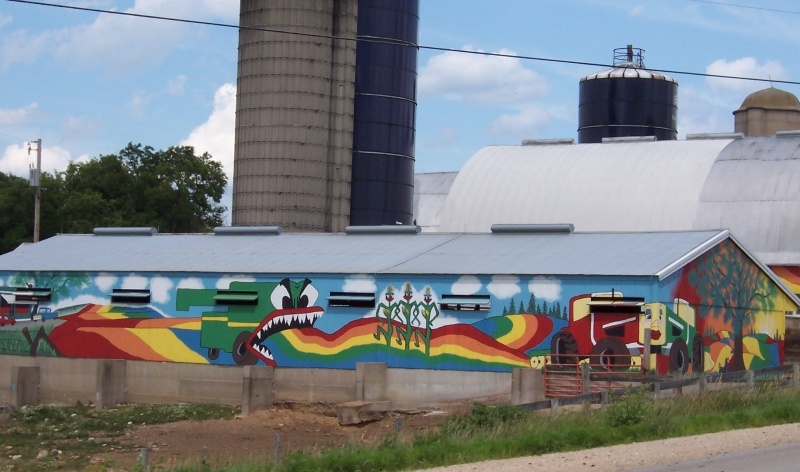 Sun Prairie has become a brewing town, as so many of Wisconsin’s towns have. The city has two craft breweries, each within two blocks of each other in the burgeoning Cannery District downtown. Full Mile Beer Company & Kitchen (132 Market Street, 608-318-2074) focuses on locally-sourced ingredients for all their brews and their kitchen offerings, which they describe as “comfort foods with a twist,” often making use of their Mugnaini wood-fired oven for pizza and perhaps a few other menu items. The beer selection there is a vast, all brewed on-site in their 10 barrel, three-vessel brewhouse. If you prefer spirits, they offer a wide selection there, too. 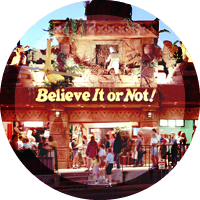 You’ll find Full Mile two blocks off Highway 19, within eyeshot via Market Street by the heart of The Cannery district. Meanwhile, right along Highway 19 at 239 E. Main Street, you’ll find Right Bauer Brewing Company. Located in a narrow downtown storefront, Right Bauer uses many terms from the card game Euchre, of which founding brewer Martin McNally and his wife Erica are big fans. Right Bauer opened in October, 2018 and brews a variety of styles with five or six of their own beers offered at any given time along with 5-10 carefully selected craft brews from others around the area. Right Bauer’s kitchen smokes up a lot of meat for BBQ offerings, along with fried cheese curds (made with Muenster, an awesome way to do it) that are great on their own or as part of a poutine dish. Based on our most recent visit, we recommend the Peaches & Cream IPA and the Nitro Milk Stout, but hey – that’s up to you. 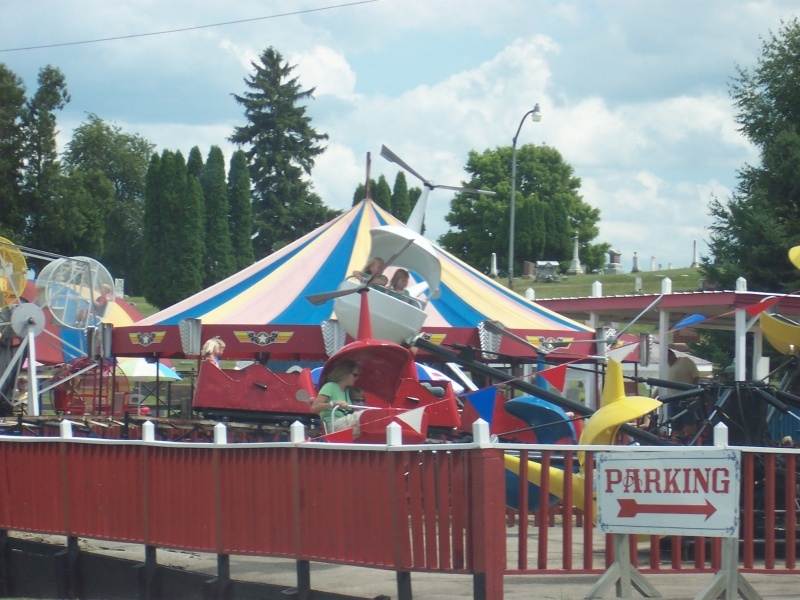 On the southeast edge of downtown is Angell Park, home to longtime dirt racing track Angell Park Speedway. This 1/3 mile oval dates back to 1903 and has been racing midgets since 1936. Drivers like Stan Fox and Jeff Gordon have competed on the track, and its illustrious history led it to being home to the National Midget Racing Hall of Fame. Open during the racing season, over 120 inductees are showcased including drivers like A.J. Foyt, Parnelli Jones and Ron “Sleepy” Tripp, who got his nickname because he would often fall asleep in the cockpit of his racer waiting for the next race to begin. Angell Park Speedway, a 1/3-mile dirt oval with a long history and the National Midget Racing Hall of Fame to boot. With noise that would scare a Who concertgoer, cars whip around and dirt flies at over 100 mph: yes, midget races are fun to check out! 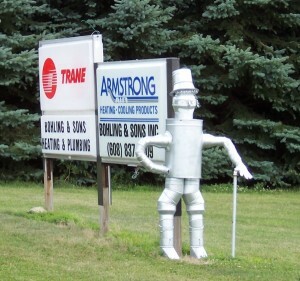 There’s no shortage of interesting roadside views on this stretch of Highway 19. A colorful design on a barn, for example…. After a few more miles, Highway 19 reaches Marshall (pop. 3,432), known in previous incarnations as Bird’s Ruins (after fire destroyed buildings during in 1838 as the village was getting established) and Medina. Located along the Maunesha River, Marshall is tucked into the northeastern corner of Dane County and is increasingly headed towards “suburban bedroom community” status. 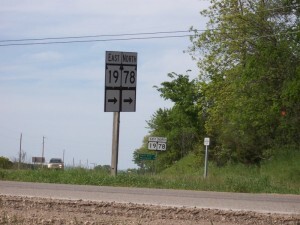 Downtown features a crossroads with Highway 73. 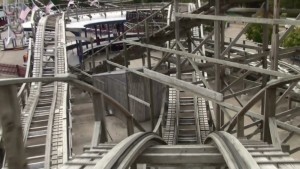 Marshall has a permanent seasonal amusement park known as Little Amerricka, which features rides, a Moonwalk, a carousel, a small roller coaster, and even a mini-train ride called the Whiskey River Railway. 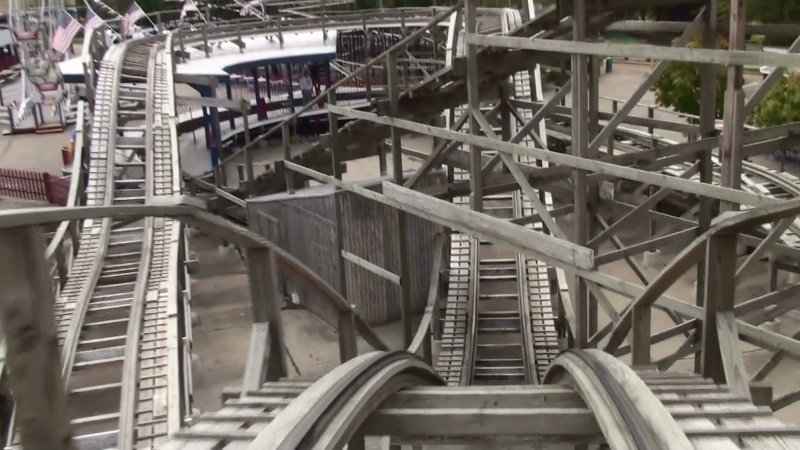 It’s a fully operational 1/3-size railroad that rides along 3 miles of track on a tour. 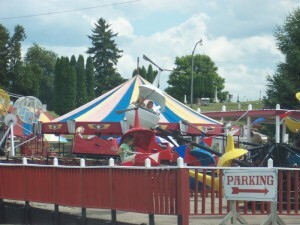 Little Amerricka has all kinds of rides, including carousels and trains, an easy way to have amusement park fun without much hassle or travel. 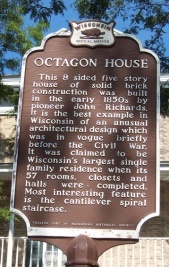 Past Marshall, Highway 19 ducks into Jefferson County and heads into ABBA’s favorite Wisconsin town, Waterloo (pop. 3,259). Like Marshall, Waterloo is on the Maunesha River in the far corner of a county: this time, it’s Jefferson. 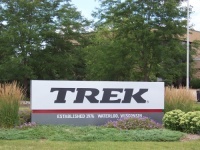 Waterloo is the home of Trek Bicycles, and you pass its headquarters coming into town on the west side. Waterloo is also the home of Van Holten’s Pickles, innovator of “pickle-in-a-pouch” and today the world’s largest producer of individually-wrapped pickles. Heading into downtown, you meet up with Highway 89, which joins Highway 19 through town before breaking away towards Lake Mills. 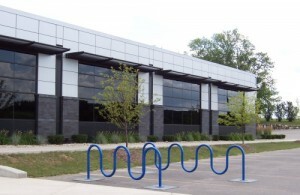 Waterloo is the World HQ of this iconic bike brand. 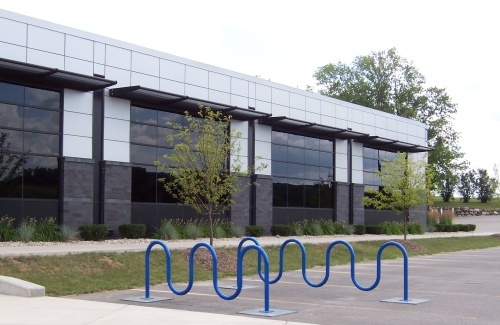 And of course, TREK’s HQ has bike racks right out front. Okay, we couldn’t resist. When I think of Waterloo, I think of the song..and it’s a fun driving song anyway as long as nobody’s watching. So, straight from German television in 1974, courtesy of YouTube, enjoy this riveting performance of ABBA’s “Waterloo”, complete with sort-of dancing, lip-synching and fake instrument-playing to the song. And the outfits… well. 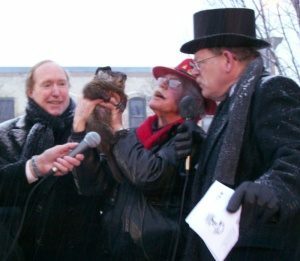 Oh, and don’t forget the German host in an attempt to look like Napoleon introducing each member afterwards. You’ll see. 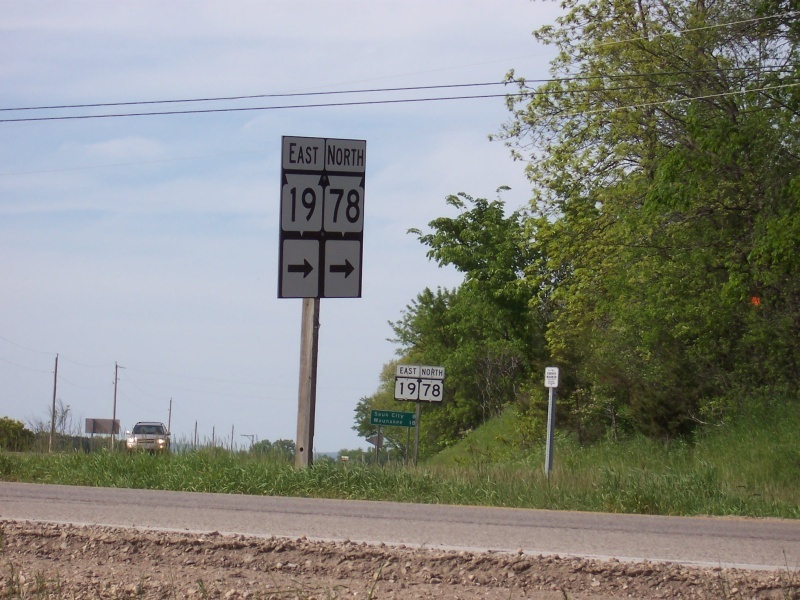 Meanwhile, Highway 19 heads a but northeast into Dodge County and tiny little Portland, which has 3 more bars than the Town of Portland in Monroe County (thanks to State Trunk Tour reader Anthony from Waterloo for that one! 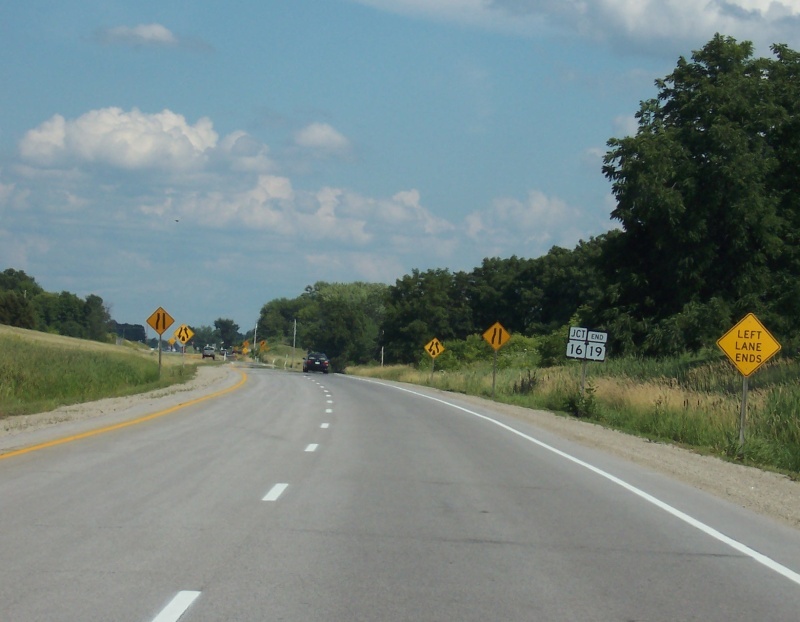 ), and from there Highway 19 cuts through Waterloo State Wildlife Area and the humble hamlet of Hubbleton, threading more or less along the Dodge-Jefferson County line. Yes, another craft brewery along or near Highway 19! 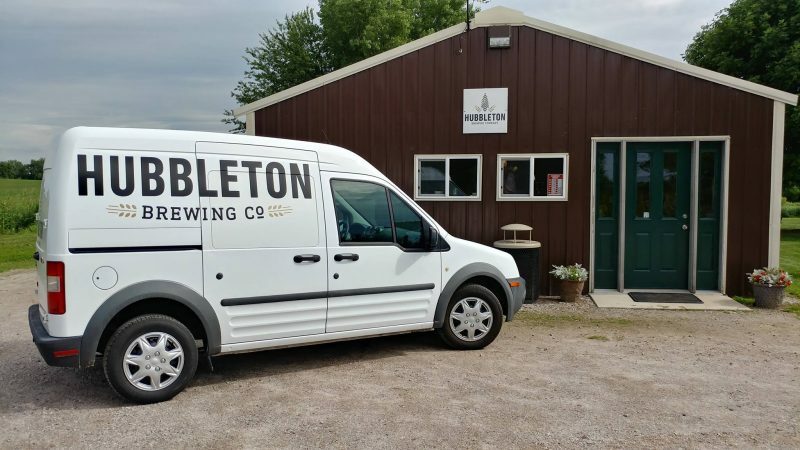 And since nobody just happens to drive past Hubbleton Brewing Company (W10445 Hubbleton Road, Waterloo, 920-253-7141) we decided it should be pointed out here. 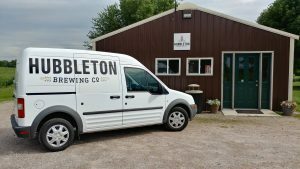 Following County BB north to Hubbleton Road and heading east briefly, you’ll find this fledgling brewery on the Schey family farm – next door to their house after a long ride up their driveway. The family farm and residence also includes a three-acre hop farm. The hops are used in their beers and are also sold through a collective called Arrowhead Hops; founder and master brewer Dan Schey was also founder and first president of the Wisconsin Hop Exchange, which manages the hops of more than 65 growers in southern and central Wisconsin. The brewery itself is behind the tasting area. Hubbleton Brewing uses a 3-barrel system and plans to expand to 10, especially as they break ground on their new, larger space later this year. Tours, which don’t take long, are available on Saturdays and upon request, as Dan will proudly show you their layout. Back to Highway 19, the drive east continues toward the newer Highway 26 freeway bypass of the town that launched a school grade and has a river running through it – twice. The main drag in Watertown, which is Highway 19 – and was U.S. 16 until 1962. Today, this section is also “Business” Highway 16. A nice summer day along the Rock River in Watertown. 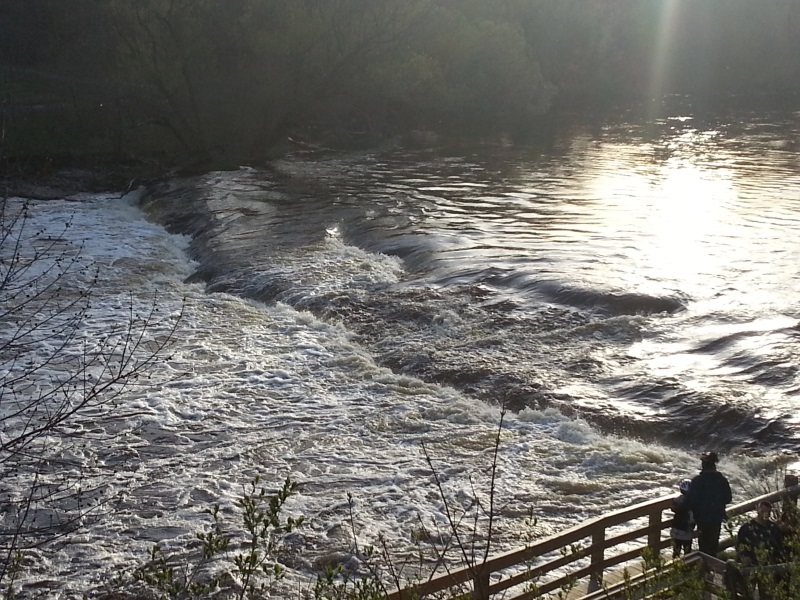 Water levels can vary greatly – we’ve seen this park submerged before. Highway 19 is a relatively brief and pleasant drive, which makes for a good afternoon. You have good access to and from Madison, Milwaukee and points in between, as well as a series of other State Trunk Tour routes. Enjoy! Highway 19 ends as it merges into Highway 16 east of Watertown, heading towards Oconomowoc. Highway 19 once continued all the way to Milwaukee; it was truncated back to Watertown in 1947. • Highway 19 once ran from Sun Prairie all the way into Milwaukee from 1918-1947 before it was pulled back to end in Watertown. 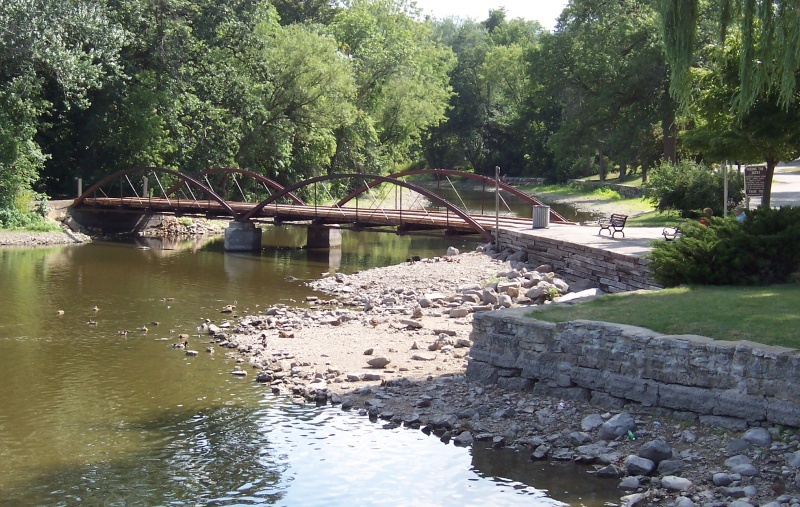 • The Rock River runs through Watertown twice. • While considered an unofficial "northern bypass" of Madison, Highway 19 may become part of an ungraded bypass in the near future. 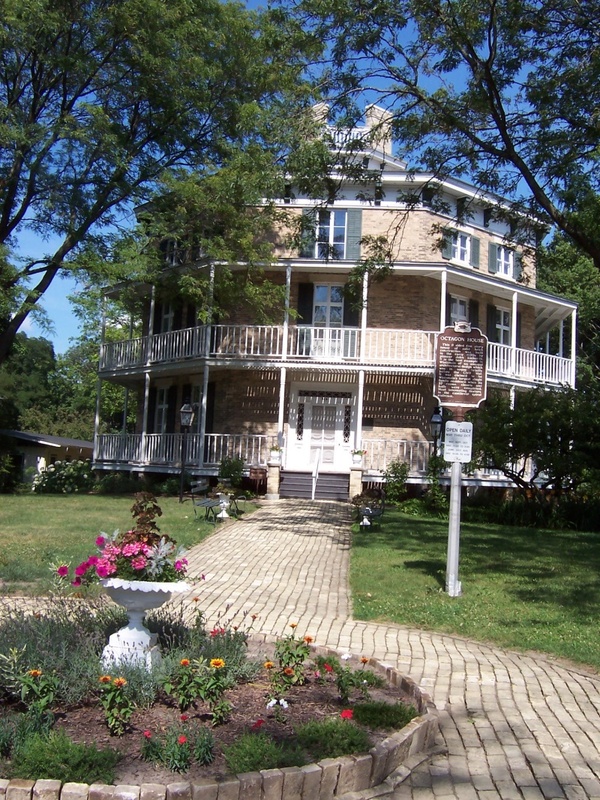 • Waunakee lays claim to being the "only Waunakee in the world."